PERFECT for reading, dentistry, camera and clock repairs, sculpting, artistry hobbiests, modellers and many other intricate jobs. Fits all head sizes with its adjustable head band and sits comfortably because of its cushioned head band. A light sits at the tip of the peak for instant clear light. Uses two AAA batteries (included). 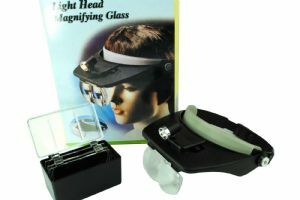 Four strengths of magnifying lenses come with this kit, stored in their own case to keep them out of harms way. The magnification strength starts at 1.2x all the way up to 3.5x Lens. 240mm x 160mm extendable to fit. Light works with 2x AAA batteries (included). Sliding switch for light on top. Light can be easily be moved to 60 degree vertical and 25 degree horizontal. Head band adjusts to fit any type of head ( even the biggest ones).